The Hunger Games is a good story in desperate need of a workable screenplay. 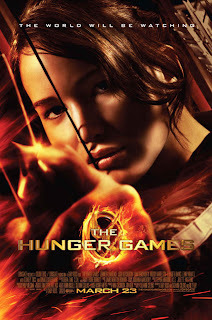 An adaptation of the juggernaut young adult publishing phenomenon by Suzanne Collins, it’s yet another troubling entry in an increasingly long line of book-to-film translations – including Harry Potter & the Deathly Hallows Part 1 and the Twilight sequels - that forsake narrative coherence, pace and energy in favour of slavish devotion to fans of the source material. This isn’t really a stand-alone movie, so much as a cinematic companion piece for readers. I strongly recommend bringing one of them with you, should you be one of the uninitiated. Because boy, oh boy, are you going to have questions by the time the credits finally roll. Set in an undetermined time in the relatively near future, The Hunger Games depicts a twisted, shattered North American society where a debauched government picks one boy and girl from each of the surrounding 12 poor districts and pits them against each other in deadly, rigged reality TV combat. The fighters, or “tributes,” are set loose in elaborate battle grounds to form alliances and kill their peers in order to emerge sole survivor. The ensuing sacrifices act not only as a grim reminder of the years of turbulent rebellion that scarred the land, but also as a form of grand entertainment, providing hope to the masses struggling to endure the impoverished day-to-day toil of their bleak lives. 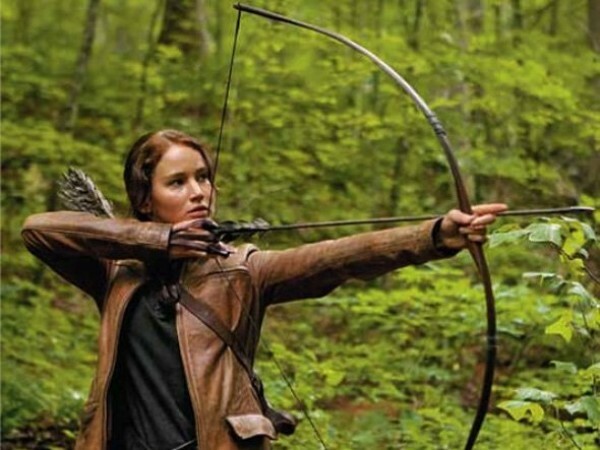 Chief among the contestants in this 74th annual edition is Katniss Everdeen (the lovely and transcendently gifted Jennifer Lawrence), an independent, resolute-minded teenage citizen of District 12 who volunteers in place of her cherished younger sister. Paired with sheepish potential showmance mate Peeta Mellark (Josh Hutcherson), she’s transported to the decadent, fashion-obsessed Capitol – a nauseating circus of fascistic, Roman and French aristocratic imagery crossbred with bubble-gum 80s rock posturing – and run through a gambit of promotional appearances and training under the tutelage of alcoholic former champion Haymitch Abernathy (Woody Harrelson). 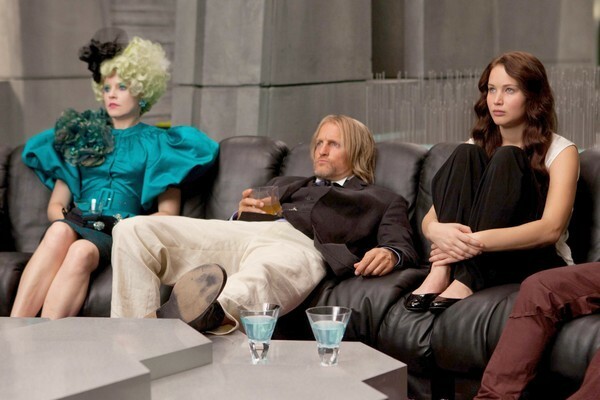 The pampering and glamour proves terribly short-lived, though, as Katniss, Peeta and their 22 fellow competitors are soon let loose in a dense, unforgiving forest, armed with swords, bows, knives and an intense, animalistic drive to stay alive. Given his penchant for penning light-hearted, mainstream-friendly fare like Seabiscuit, Big and Dave, helmer Gary Ross wouldn’t exactly seem the right man to properly service material this fierce. However, one need look no further than his 1998 directorial debut, the under-seen gem Pleasantville, to witness his skill at telling a tale about teenagers inspiring revolution against a strict, conformist authority. While he often feels adrift in this awkward, meandering affair, his spark of ingenuity still reveals itself when it counts. The early Reaping Day scene – in which Katniss is enlisted – is a chilling echo of Shirley Jackson’s classic short story “The Lottery,” and a quiet, sombre sequence where Katniss mourns the death of a friend is delicately handled. He also does a solid job building to the main event, with Katniss’s entertainingly bizzarro trip to the Capitol (slightly hindered by dodgy CG and obvious soundstage work). Too bad, then, that once chaos reigns, he’s hamstrung on how to make the games exciting. There’s no momentum or ticking clock urgency to the competition, and the brutal clashes are rendered in often horrendous eyesore bursts of shaky-cam obnoxiousness. 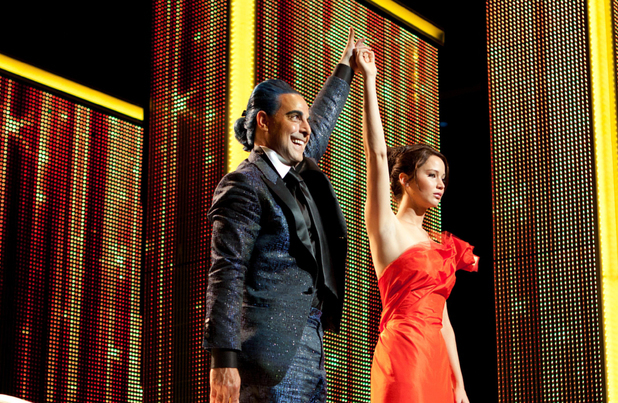 Of course, Ross’s most egregious problems lie in The Hunger Games shambling script. Co-penned by author Collins and Billy Ray (Breach, State of Play), this is a film that bombards the audience with exposition, usually through Stanley Tucci’s amusing blue-coiffed MC, yet fails to paint a comprehensive picture of its world. 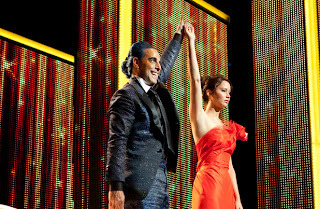 What does a Hunger Games winner actually win? Why is it so vital for contestants to please sponsors when there’s little evidence of their aid actually impacting the game in any real way? How are Peeta’s bakery-honed (!) super-strength and ninja camouflage abilities at all necessary? And let’s not get started on the vicious unexplained surprise guests in the picture’s climax! Doubtlessly, these elements made perfect sense in the original text, but on-screen they’re confusing and silly, if not utterly pointless. Even more aggravating is the absence of depth in Katniss’s opponents, several of which play major roles and whose deaths have serious ramifications. It’s pretty hard to care about a competition in which only two participants are given a personality and arc, not to mention memorable names. The film also, despite running nearly 2 ½ hours, feels rushed in the back end, as if the scribes were trying to jam everything in on their mad dash to the end. Events just seem to happen one after another, with zero breathing room. And the less said about the limp, semi-cliffhanger ending the better. Perhaps the picture’s wheezy plot machinations might have been easier to ignore if the film had something truly bold to say. The use of televised death matches as a means of criticizing grotesque reality TV sensationalism is hardly a new thing (Death Race 2000, Running Man and Series 7: The Contenders already covered similar terrain), and neither, thanks to Kinji Fukasaku’s masterful Battle Royale, is the notion of kids being forced into committing heinous acts by a cruel, totalitarian Big Brother. By contrast, The Hunger Games, which is aimed at a younger demographic than the aforementioned titles, doesn’t seem fully committed to edging into any sort of bracing moral grey area. 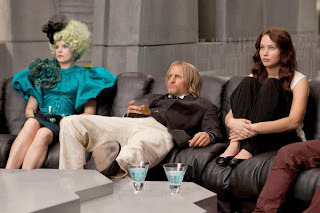 The youthful fighters practically step onto the field wearing Good and Bad labels (no examples are made of a player being gradually corrupted by the games), and Katniss isn’t forced into having to intensely consider deliberate murder; the choices are predominantly made for her. Moreover, the adults controlling the gruesome spectacle seem largely ambivalent to it all. Harrelson and Kravitz show fondness towards the heroine, yet aren’t visibly haunted by their roles in her potential demise. The film skirts intriguing thematic territory without ever quite building up the guts to dive headlong in and say anything genuinely original. To her infinite credit, Jennifer Lawrence not only delivers a dynamic, layered, physical lead turn, but actually succeeds in carrying the entire picture on her toned shoulders. Simultaneously exuding stubborn inner-strength and frightened vulnerability, the actress digs down right to the emotional truth of her character and commands the screen effortlessly. She’s particularly excellent when playing off the surly, campy Harrelson and a warm Lenny Kravitz (as a nurturing stylist), especially in her poignant final minutes of freedom before entering the arena. If Winter’s Bone – a film The Hunger Games often seems to be paying homage to in Katniss’s early home life – established Lawrence as a dramatic powerhouse, this picture rightfully launches her into the stratosphere of movie stardom. Make no mistake: Lawrence is the dominant draw, well above the modestly interesting ideas, performances and individual scenes swirling around this slightly bland, lukewarm sci-fi soup. This is a picture that cries out for braver filmmakers; people willing to make big sacrifices and alterations, and able to refine Collins’s beloved novel into a clear, proficient piece of populist cinema with its own vision and value. 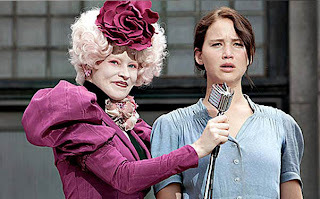 Although The Hunger Games is not without its minor pleasures, ultimately it only leaves you wanting more when it’s over. And not in the way you’d hope.